ISBN 9780825640629. 9x12 inches. Music for Millions Series. An exciting assortment of piano works that are musically and technically rewarding as study pieces, and appealing in recital. The music is on a level with that of the 18th and 19th century masters. 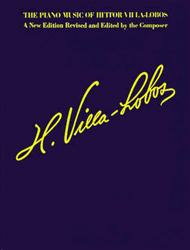 This edition revised and edited by the composer. This title has selections that range in difficulty from SMP Level 6-10. Guia Pratico - Album 8 - 2. Carambola Goodness! A sparkling music and a melancholy musica at the same time, in Brazilian spirit. Wonderful! some difficult to read pieces. This Amsco edition, attributed to the composer himself, contains pieces ranging from children's level to extremely difficult. It includes the familiar Bachianas Brasileiras No. 4, Suite Floral, the instantly recognizable O Polichinello, selections from Prole de Bebe, and nearly 40 others. The typeface is uniform and crisp. However, it would be even better if a competent editor could provide fingerings (there are none) and suggest alternative notations for the numerous passages that are spread over multiple staves. music by Villa-Lobos from another publisher.